I’d heard these lines spoken multiple times in an ad that appears at the very end of each of the Dark Shadows: The Beginning DVDs, long before I’d seen Quentin Collins on the show or grew to recognize Angelique’s evil laugh. Intriguing as the ad might be, however, these phrases never really gave me an idea of what the story behind them was about. A lesser man might be daunted, but Quentin has lived over a century and seen plenty of weird and horrible things going on in his hometown. He gets off the train, and soon finds that the town is worse than ever. Collinsport has almost literally become a ghost town. Few people remain in town since the cannery closed, and many of those who still live there are in a dazed state. They’re called The Lost, since they go about wandering the streets at night as if they’re looking for something. They don’t even seem to remember who they are. Flocks of strangely behaving seagulls also menace the town. Townsfolk who are not afflicted lock their doors and stay in after nightfall. One of the few exceptions, Maggie Evans (Kathryn Leigh Scott), is now the proprietor of the Collinsport Inn, where she once worked as a waitress in the cafe. * The Collinses gave her the money to buy the place as an incentive not to talk about the things she saw while she was working up at Collinwood. Not that the Collinses are around to mind about their reputation–according to Maggie, Quentin’s family disappeared, leaving an empty house as well as an empty town. Maggie warns Quentin not to go up to Collinwood, but of course he does, dragging a reluctant Willie Loomis with him. Willie (John Karlen) lives in the cottage on the Collinwood estate. He does his best to look after the grounds and, like Crazy Future Carolyn as seen in Barnabas’s and Julia Hoffman’s brief trip to 1995, he’s salvaged what he could from the house–family portraits, silver, that big tapestry that hung above the stairs, Quentin’s old gramophone–but he won’t go into the house since the Collinses left it. He tells Quentin that he tried to save them, but never makes it clear exactly what happened to them. This only makes Quentin more determined to go into the abandoned house, in spite of the repeated warnings. As Collinsport is full of “ghosts,” so Collinwood is occupied by the strange birds, hundreds of them (the two are connected). The are controlled by an unseen entity with a deep and diabolic voice that declares “This house is mine.” Willie and Quentin flee before the birds go all Tippi Hedren on them. 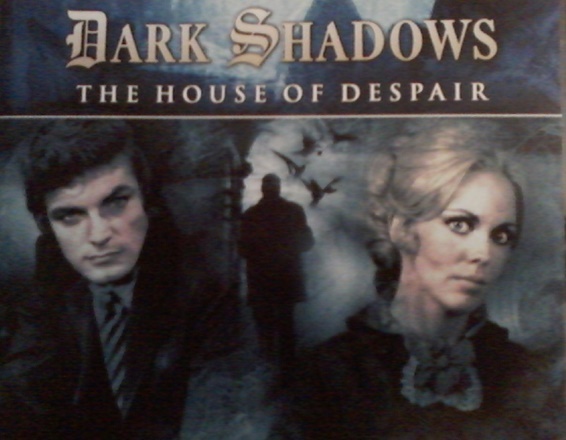 This plot does remind me of that earlier Dark Shadows visit to the future: the Collinses dead or mysteriously gone, their family name disgraced, and their home occupied by an evil force. A handful of lone survivors are left to face the evil and puzzle the mystery out. Driven out once, Quentin decides that he’s going to need more powerful reinforcements if he wants to combat this being, reclaim his family home, and find his missing family. He summons up Angelique (Lara Parker). Whether or not this turns out to be a horrible mistake remains ambiguous. Angelique’s been conversing with this same deep-voiced entity on some non-material plane since Quentin returned to town, but after some sarcastic banter, she agrees to go into the house and confront the creature that’s taken it over. It’s a darker story than Jamison Selby’s audio play, Return to Collinwood (although the younger Selby is one of the voice actors here, working with his dad in a minor role). The two storylines are not related and project divergent futures for the characters after the end of the television series. The Collinsport that Quentin returns to in this story is grim, and his dialog is wry and bitter even in its wittiest moments. This is a world-weary man who’s seen a whole hell of a lot of darkness in his 100-plus years of life and isn’t afraid to jump right into dangers he’s been warned against by more sensible, and more mortally vulnerable, people like Maggie and Willie. He knows, after all, that very little can harm him. There’s a nice twist when Mr. Strixs, a collector of souls, tries to capture Quentin’s and discovers that he doesn’t have one. Unlike most people, Quentin Collins doesn’t carry his soul with him, but keeps it in his portrait, which is safely hidden away and locked up somewhere. But that’s not the end of the story. The House of Despair is only the first part of an ongoing drama, so not all of the problem introduced here is resolved. This part sets the situation up and brings the principal characters from the series back into play. Which brings me to the one thing that irked me when I first listened to this: When Angelique eventually resurrects Barnabas, they make an issue of him having a different face and body, because he has a different voice (Andrew Collins, I believe; there are several actors listed by name but not credited by their roles on the CD liner notes). They didn’t have much choice to recast. Johnathan Frid had died and was no longer available. But this is an audio play; it’s not as if the listener could see what Barnabas looks like. The show made more egregious substitutions in its main cast back in its heyday. *When Quentin drops in at the inn, Maggie is playing the 1960s surfer music that the Blue Whale always used to. I thought at first that Maggie had bought the jukebox, but the same music is playing at the Blue Whale when Quentin visits it later. Perhaps it’s just her favorite song, in remembrance of happier times?